Do you have cooking abilities? Can you cook without cursing, burning food or cutting yourself? If the answer is yes, then you can cook even in a hole in the wall. If you are not in the class of people who can make wonders and miracles in any space, a minimal knowledge of how to work in a kitchen and what is the best floor plan is of the utmost importance. 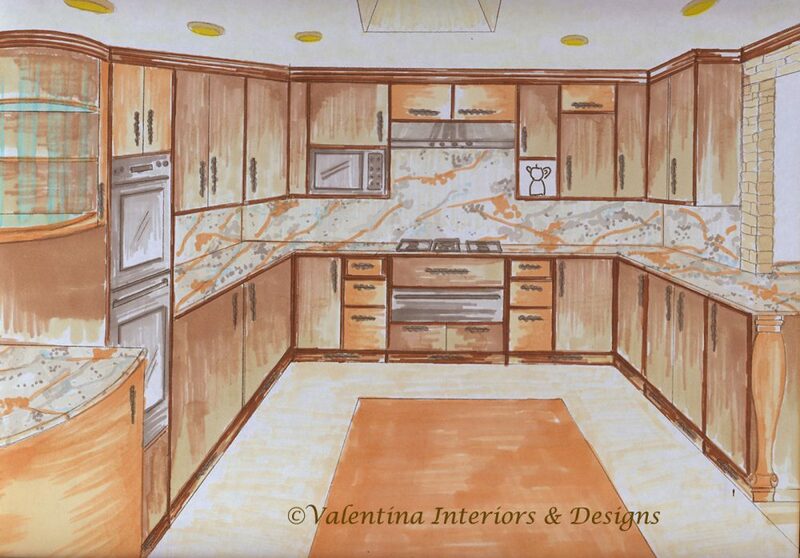 The ruling factor is the space between appliances, cabinets and the person/s working in the kitchen. For convenience the dishwasher sits near the sink. 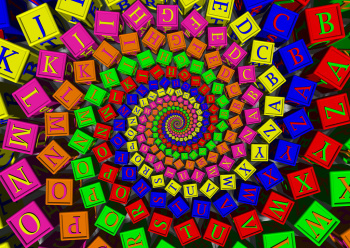 Are you a left-handed or right-handed person? How you rinse dishes and load the machine is a simple fact that will determine the location of the dishwasher on one side of the sink or the other. The choice of flooring will make or break your desire of wanting to be in the kitchen for long hours. Cooking is a pleasant activity of the day, which feeds stomach and soul thus flooring should alleviate the chore. Hardwood floor, bamboo or cork floors are the best choices for the legs and of course in the wet areas (sinks, stove) the use of some tile is appropriate. 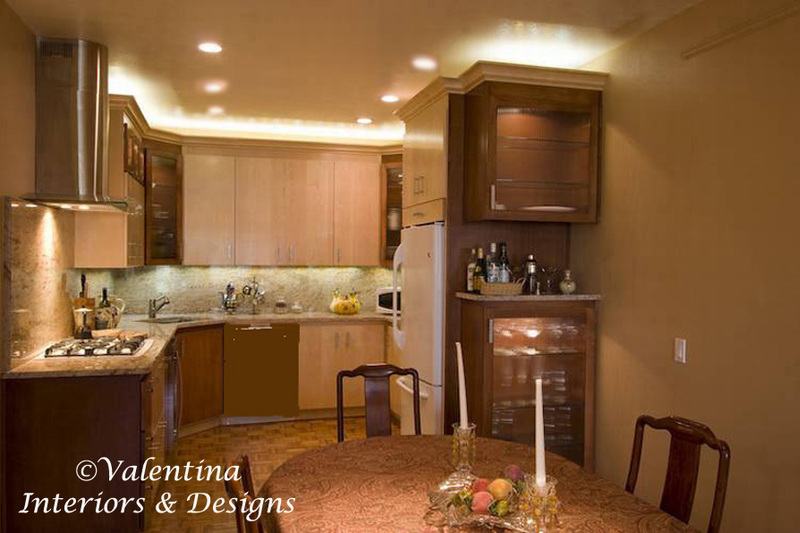 Lighting is the next and most important factor for a successful kitchen design. Kitchens and baths are the two places of the house where the best accidents happen. Light the kitchen well with style, create shadows and highlights, place it in the right areas and avoid the showroom look, I truly dislike it! I could talk about kitchen details from now to the year 3000, not only because I cook and understand the needs of a chef, but because I am trained as the expert in kitchen designs. The purpose of this post is to elaborate on a U-shaped kitchen floor plan, which is the best workable floor plan for small kitchens and because I needed a topic for the letter U in my challenge Home from A to Z. In this floor plan a peninsula is easier to incorporate than an island in the middle of the floor, however many roll-out leafs for cutting, mixing and preparing can come out from under the counter top in various areas. Refrigerator in this floor plan is never placed in a corner, as it will waste space, hit and block cabinet doors, but near the sink, if possible. It’s convenient to take produce out of the refrigerator and place them in the sink for washing. 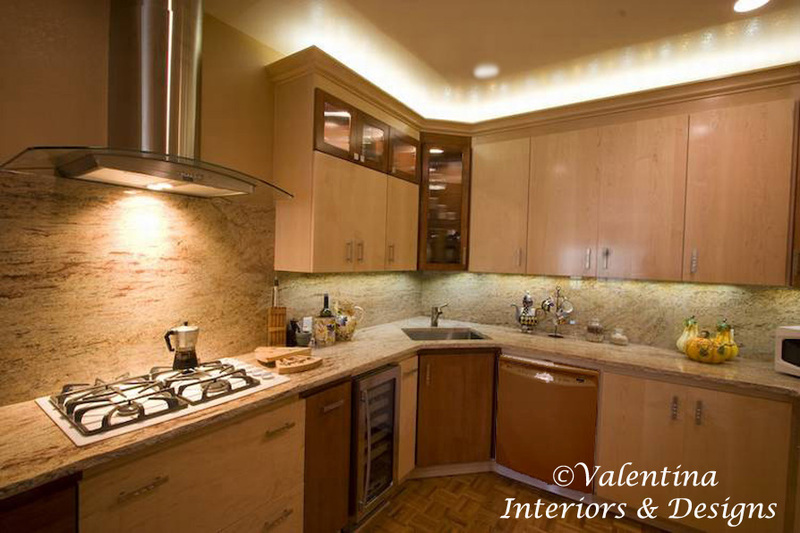 Allow a minimum counter space of at least 18” between refrigerator and sink and of course more if floor plan allows it. The next best place for the refrigerator in the U-shaped kitchen is near the stove/range for easy accessibility to food, when something quick inside of the fridge is needed during cooking. Refrigerator, sink and the range are the three areas of this floor plan that must create a “triangle” for workability and extreme functionality. The sink needs the stove as the stove needs the sink. It’s a formula that gives the best results when carrying hop pots/pens from the stove to the sink, like draining pasta, or transferring wet vegetables from the sink to the stove. The vicinity of stove to sink will avoid spillage, messy floor and dangerous slips. Not more than two people can work in U-shaped kitchen. Keep in mind that appliance doors open and occupy a space of at least 24″ therefore must not hit each other and a person of a normal size occupies a space of 18″. All of this must be added to the dept of cabinets and appliances to create an ergonomic kitchen. Admire a couple of my work in the photo gallery. Once you have a perfect working triangle, it’s time to think of the finishing touches that will give a U-shaped kitchen a lovely look. As I said before, cooking is a pleasant activity of the day. Before start cooking I put on either classic music or Opera, you choose your own music, open a bottle of wine and feed your stomach, soul and mind. In the meantime, you have controlled sugar, fat, salt intake and controlled your portions, because you cooked for your palate and not for what any restaurateur wants you to eat. At the end you will feel like a million dollar. Valentina, I have nominated you for some awards. Please stop by and pick them up! Congratulations! http://moggiepurrs.wordpress.com. Thank you Beverly, I am very flattered. In a few days I will write a post and give you a proper credit. Thanks again. Beautiful post, Valentina, so true, so practical, so inspiring. I have a tiny galley kitchen yet I stil manage to looove cooking because I made sure that the ‘little’ but important factors were included (sink next to dishwasher, size of sink, and the magic triangle you explained). I have cooked in larger kitchens and found it much harder because everything tended to be scattered all over the place. At the time (over ten years ago now) I was also inspired by Feng Shui considerations: fire and water must be at least 60cm apart (more is better) and (weirdly) no mirrors in the kitchen, either. The cook’s “back” must be protected at all times … i.e. people shouldn’t be able to walk behind the cook while he or she is cooking. To me that makes a lot of sense (averts nasty accidents for starters) and that’s why I am not at all a fan of island top cooking. You are absolutely right about the cook’s back being protected. 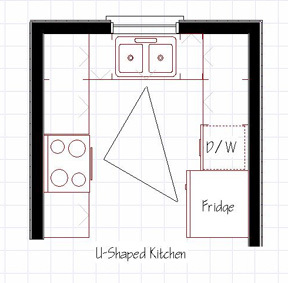 I found the U-shaped or galley kitchen the most functional floor plan. Thanks for the visit and the comment. Valentina, you have a gorgeous blog site. 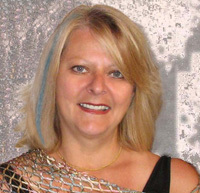 I love your work!! Thank you for the visit Beverly.